I am not sure any of that tour was ever filmed but it was to me one of the best shows I ever saw close up..
Last edited by pbs1902; 05-14-2018 at 11:41 AM. 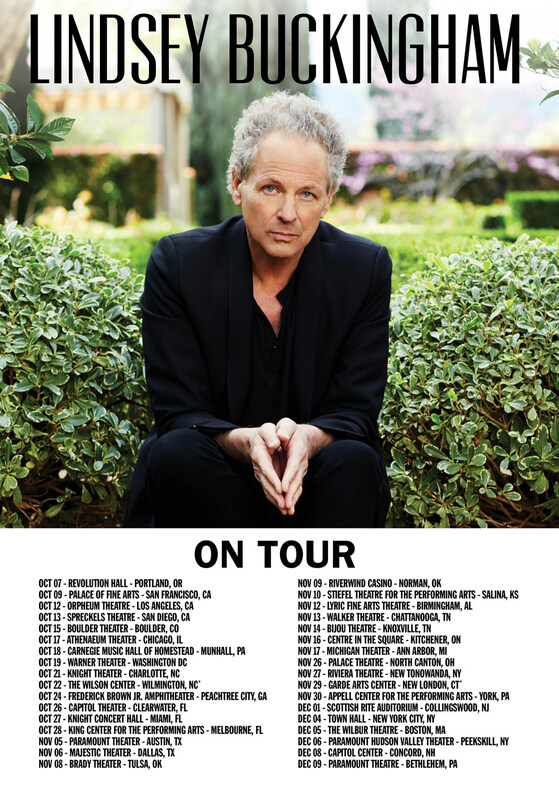 This fall Lindsey Buckingham will head out on a North American Tour in support of his Solo Anthology. The tour kicks off at Revolution Hall in Portland, OR on October 7th, with highlights along the way, including LA's Orpheum Theatre and Town Hall in New York. Tickets go on sale Saturday, August 18th. 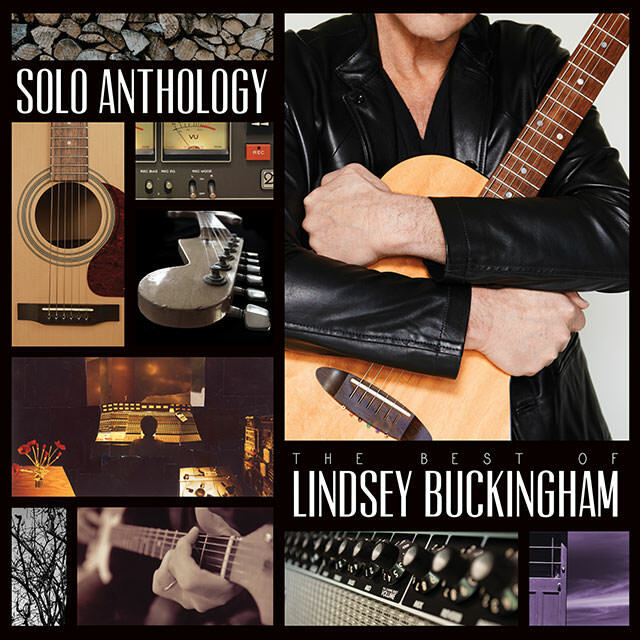 Every ticket purchased online for the Lindsey Buckingham tour includes a CD or digital copy of the new Anthology. * Fans will receive instructions via email on how to redeem their album after ticket purchase. Interesting. I look forward to tour dates. I am looking forward to the remastered versions. Interesting that some are not remastered. I have the Ann Arbor Michigan show on my radar. Not really my favorite venue, and a 90 minute drive, but I would love to see Lindsey again. The compilation looks cool too. I don't have a ton of his solo stuff. I've seen him twice solo, would like to see him again, but kind of a strange selection of cities as he goes through the Midwest: Tulsa OK, Norman OK, and Salina Kansas!? but no KC or St. Louis; Knoxville and Chattanooga Tenn but no Memphis, Nashville, Louisville, Cincy or Indianapolis. It is a bit odd that in Michigan he is playing Ann Arbor and not Detroit or Grand Rapids. I wonder if there is some kind of "no compete" clause with Fleetwood Mac for live shows? That kind of thing sometimes happens, and FM are playing both Detroit and Grand Rapids on this tour. Yep, maybe, he certainly isn't hitting a ton of major cities in this part of the country. At least Ann Arbor and Norman Ok are college towns, although that certainly isn't his core fanbase now. The Salina Kansas one really makes me chuckle because its a small town in the middle of the Kansas prairie near where the Clutter murders took place. add--you may be on to something as I see that FMac is playing KC, StL, Indy, Louisville and much larger cities generally during relatively the same time frame. Last edited by DocProgger; 08-15-2018 at 12:27 AM. Interesting. I remember there was an advert in the UK some years ago which had the song 'Holiday Road'...I later discovered it was never on any of his albums and was quite rare! I am interested in hearing how the Cradle tracks adjust to a remaster. I also feel the original disc is pure and fine as-is. There are a few studio versions of "Holiday Road." I have the 5+ & 3+ minute versions and am ecstatic we finally get one on this compilation. Fans have hoped for a release of Lindsey's soundtrack work on a Buckingham album. I would have loved to see the inclusion of the sublime "On The Wrong Side" from the 1994 movie, With Honors. Of note, the other missing soundtrack songs: "Sick Of You", "Brother & Sister" (featuring Norah Jones), and "She's Act Like You", from 2012's film, This Is 40. Regarding tour dates: it is common for Lindsey to do a couple of swings across the U.S.A. (pun intended) when he tours. Out of the Cradle appears to be OOP so that might explain why so many of the tunes on the comp are from it. I'm disappointed that "Right Place to Fade" didn't make the compilation. If that had been on a FM album it would have gotten a ton of airplay. I pulled out the live album "Songs From The Small Machine" for a listen today. It and the DVD are great if you have never heard it. Don't deal with Ticketbastard anymore so I'll just pick up some tickets on the day of the show. Did they normally use a second guitarist when Lindsey was in the band? They have three in that video. Neale Heywood (longtime friend of Lindsey's) and Brett Tuggle. Brett is mainly the 2nd keyboardist, but he does handle acoustic. They are also members of Lindsey's solo band. They've been a part of the FM touring personnel since the 1997 reformation. Not in their early days, of Rumours, Tusk, etc. I think they brought in a lot of extra players when the reunited for the Say You Will album and associated tour in 2003/04. Now, of course, they're getting ready to hit the road without Buckingham but with Tom Petty/Heartbreakers' Mike Campbell and Crowded House's Neil Finn. It's the first time I've been excited about the group in awhile, to be honest. It will be very different than with Buckingham, but Campbell and Finn have a lot to offer, I think. As for Buckingham's solo career? While not always as successful in its risks as he was with Fleetwood, I always loved his production skill, his ability to craft odd but still hook-laden songs...and he's one heckuva great guitarist. Coming, relatively late, to Mac and associated solo careers (because I worked in a record store when Rumours was first released, and it was so overplayed that I burned out on Mac, and couldn't even think about them literally for another 35 years. Now I love 'em, the same way that I couldn't handle the Eagles (Hotel California was another overplayed record in the store) but now am a major fan. But Buckingham stands out, as much for his production innovations as his songwriting, singing and guitar work. I've all his solo stuff and, while I've not seen him, have a couple live shows on DVD/Blu Ray and would love to see him! Looks like Brett Tuggle is the only returning solo band member. I forget about Lindsey's solo career sometimes, and it's a shame. He's got some pretty good stuff. And I really like his guitar style. Makes me want to work on my finger picking. Seeds We Sow is one of my favorite albums - full of variety, spirit, and dynamics. The title refers to the notion that who we are as individuals, and by extension a society, is largely the defined by the accumulation of choices we make; that choices can’t always be made based on which ones represent the more tangible or near term gratification; that often the wiser, deeper choice lies in the more difficult path. Lindsey is recovering from emergency open heart surgery this week. He is recovering now. His vocal cords have sustained damage, but no telling if he will recover fully. Check his Instagram for a statement from his wife.